Everyone in your gang will be delighted with the Christmas pole for family of 6 personalized Christmas ornament that's available in other family sizes too. 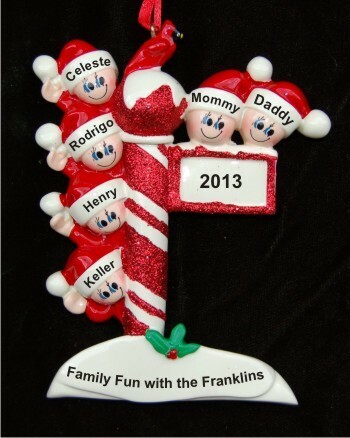 The details you provide are hand painted onto these family ornaments personalized to be keepsakes you will long cherish. Put smiles on everyone's face this year with the Christmas pole family of 6 personalized ornament with room on back for a special message when it arrives in our exclusive velvet drawstring pouch. Enter up to 32 characters. Yearly Christmas ornament for... Dec 21, 2017 Gerald C.